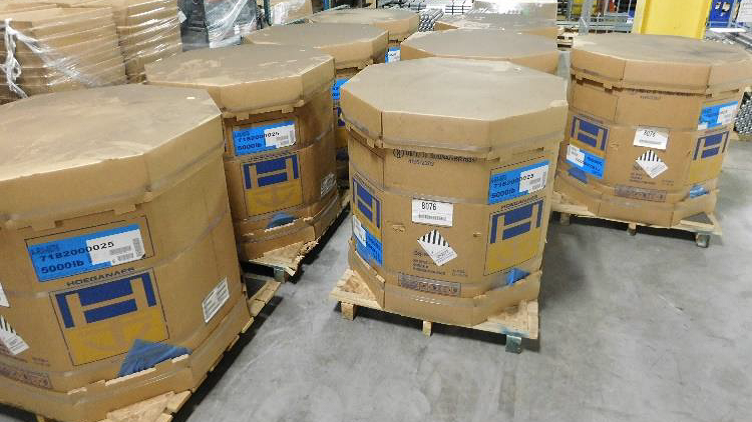 When you hear the word powder you don’t usually think, “Wow, heavy stuff,” but for one customer that’s exactly what it is and why warehousing storage and retrieval is a challenge. A global atomized metal powder manufacturer was looking for a solution to warehouse their product… we could see pallet flow rack in their future but our first stop was the Mallard Engineering Testing Lab to confirm our theory. On the surface this all looks pretty simple, but one look at the picture below and the 8 giant sample products you can see that this was going to be an interesting test. 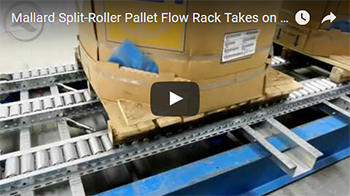 As is often the case, the pallets themselves help to determine the pallet flow rack selection and configuration. These pallets are smaller than traditional 42” x 48” pallets but they also have an overhang, and as such are called wing-style pallets. They have three full-length runners underneath with the outer two being 1” wider than the center runner. As you can see from the video, the test lane was comprised of a three-rail, split-roller pallet flow configuration that provided good contact on all three runners and good stability in the lane. Mallard drop-in speed controllers were mounted in both of the outside pallet flow lanes at 40” intervals to ensure each pallet was always in contact with a speed controller to prevent any of them from being able to pick up dangerous speed. Lastly, welded ramp stops were added to the end of each lane to hold back the extremely heavy pallet as it approached the discharge or front pallet position. While the test was successful and even when left to sit in the lane over a weekend the pallets restarted on their own, our engineers had one more safety suggestion; skate wheels mounted to the outer sides of the roller rails ensure loads stay on the rails by providing additional guidance as pallets progress down the pallet flow lane. Do you have an unusual product or inventory challenge you’d like to evaluate in our pallet flow testing lab? Give us a call today to schedule a test. You’ll receive a complete test video, pallet evaluation and system recommendation for review and approval before we move a project forward… that’s a Mallard guarantee! Thanks for your interest in Mallard’s gravity flow solutions… we look forward to working with you.